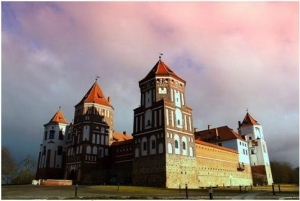 Mir Castle is a unique monument of Belarusian architecture of the 16th century. It was founded by Duke Ilinich near the village called Mir at the end of the 15th century. He built the castle instead of the wooden farmstead that existed there. During hundreds of years, Mir Castle was time and then destroyed and restored. In the year 2000, this construction was added to Unesco's World Heritage list. And now the castle is being successfully restored.The original construction was in Gothic style, but as the building was subsequently reconstructed, it absorbed architectural styles of Gothic, Baroque, and Renaissance. For instance, in 1568, the castle passed into the hands of Dukes Radziwils. Soon afterwards the Dukes completed the building in Renaissance style.The red-brick castle is a square-planned building with towers at the corners. The fifth tower has a drawbridge and a forged grille. Mir Castle was built as a fortress and it was adapted for armed attacks. The defensive elements give the building a certain solemnity.One of the Castle's greatest features is its varied and ornamental construction. Each of the five towers is made in its own way. The number of embrasures and their designs vary. Pattern arrangements on the walls are also different. Yet, tower disposition at the corners, square footing and octahedral top give entirety and completeness to the construction.It's interesting to note that despite the originality of its construction the castle in some sense outwardly resembles the 14th century red-brick convents of Poland, Moldova and Romania. This acknowledges a high level of Belarusian architects familiar with cultures of other countries.